Thanks to Valerie Bryant for another wonderful Sewing 101 session. 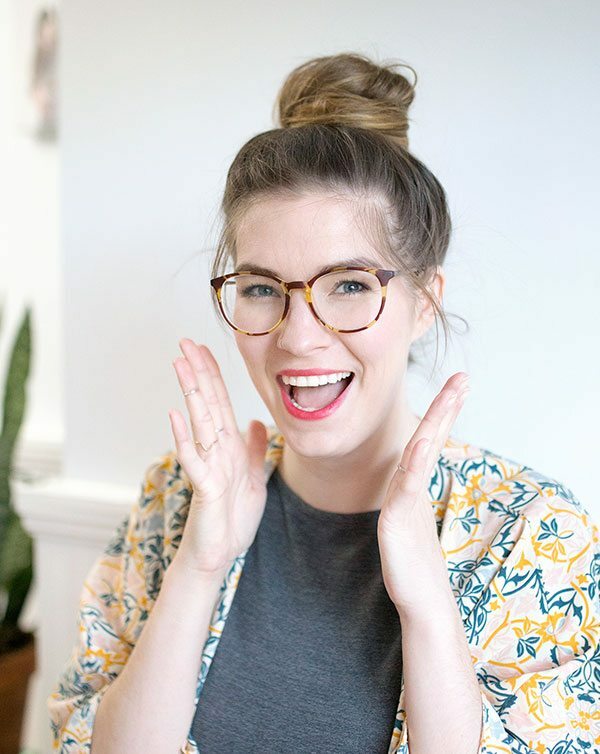 You can find more great sewing inspiration and shopping by visiting her blog Threads Thoughts Things and Dottie Adele on Etsy! 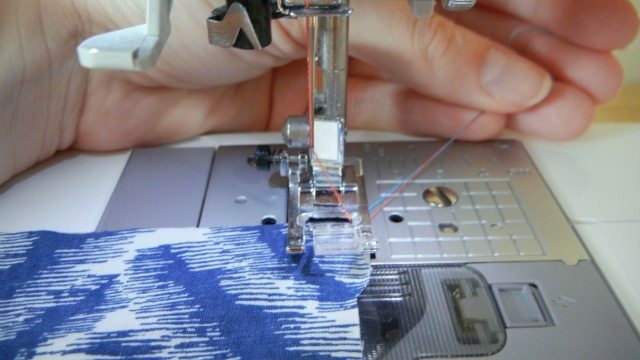 Welcome to the second course in Sewing 101! 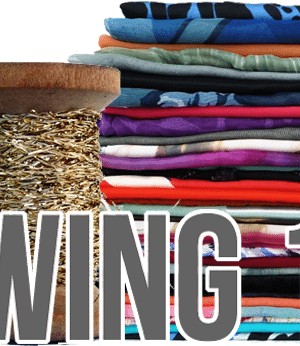 In the first course, you learned about all the essential supplies to sew everything you need. Now we’re going to do a little exploration of your sewing machine. It may seem complicated at first, but remember two things: Practice makes perfect, and YouTube holds all the answers. Here are a dozen of the most important parts on your machine you should know to get started, all numbered above and then described in detail below. 1. Power Switch – Turns your machine on and off, of course! It may seem obvious, but sometimes it is hiding in a not-so-obvious place. It will probably be on the right side near the bottom. 2. Handwheel– This wheel controls your needle manually, and you can make it sew either forward or in reverse. You’ll use this when starting out or finishing a line of stitches to lift the needle up. 3. 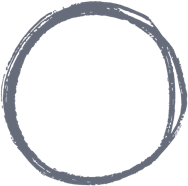 Spool Pin – Your spool of thread goes here. Mine is upright, but it’s also horizontal on many machines. 4. Bobbin– Surprise! 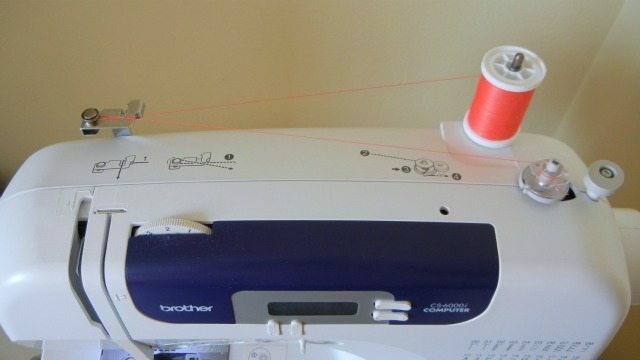 You actually need two spools of thread to sew. This one, called the bobbin, is much smaller and goes underneath the plate. 5. Presser Foot – This small metal piece holds your fabric in place as you sew. It can also change out for other feet with specific functions. 6. Needle– Your top thread goes through the eye of this needle after a series of semi-complicated maneuvers (discussed below). The needle, of course, is the most important part of the whole thing. It leads the thread through the fabric to create the stitch. 7. Plate– A metal plate surrounds the area around the feed dogs, needle, and bobbin. 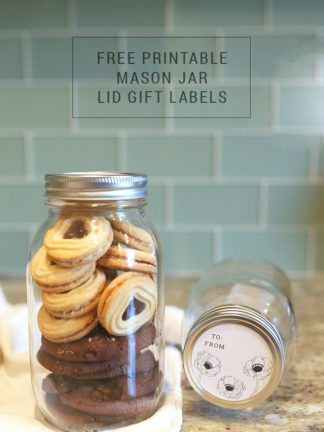 Likely, your plate will also be marked with various measurements to help you with the width of your seams. 8. Feed dogs – Besides having the coolest name of a part of a machine ever, these guys help lead the fabric underneath the foot and through the needle. 9. 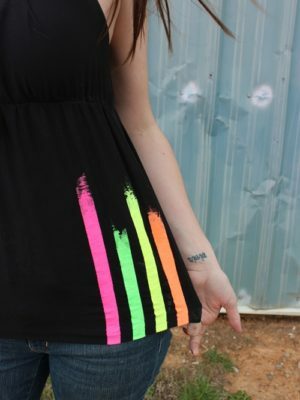 Reverse Stitch – Yours could be a lever or a button, but it will be marked with an arrow doing a U-turn. By pushing this lever or button, your machine will sew backwards. 10. Stitch Selection – My machine is electronic, but many other machines have dials with the different types of stitches. Be sure to identify a regular straight stitch and a zigzag stitch – these will be your most important. 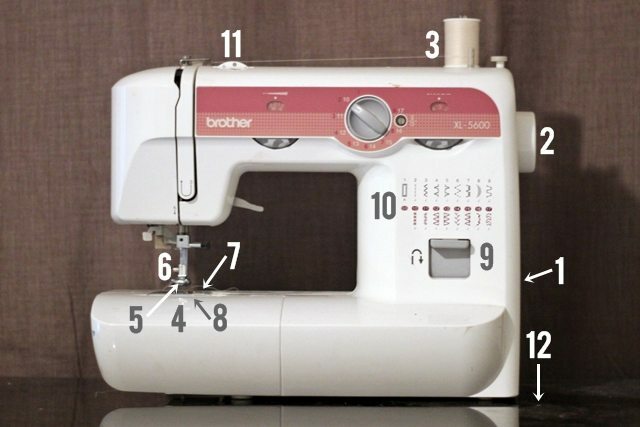 Also nearby will be another dial with numbers on it indicating stitch length – 1 is the shortest, and 4, 5, or 6 (depending on how far your machine goes) will be the longest. 11. 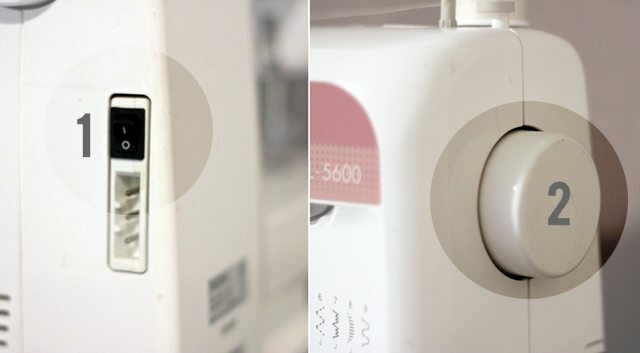 Thread Tension – A dial somewhere at the top of your machine will also have numbers on it, indicating the thread tension. 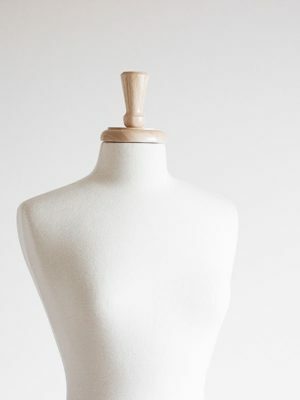 Depending on the type of fabric and thread you are using, you may need to make this tighter or looser. 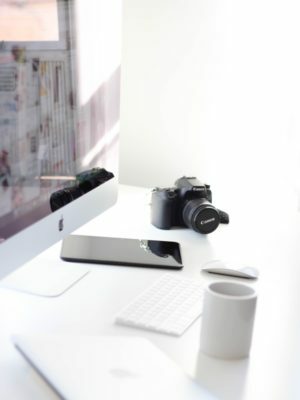 You’ll need a sturdy table (not like mine…a tray table up on blocks is not the most ideal!) and a chair with a back that will put your machine at stomach level or higher (you don’t want to be bending over too far to see your work). 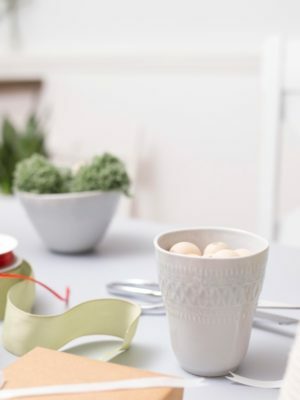 Set your table and chair up near an outlet. Also nearby: your ironing board and iron, a good source of light, and a trash can (maybe some snacks and a beverage, too). 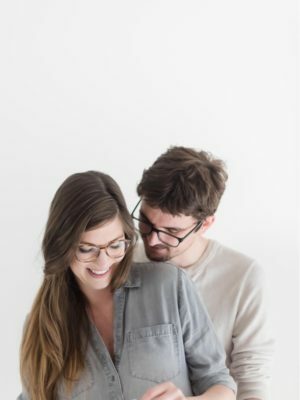 YouTube is your greatest ally in performing the following steps. If your owner’s manual isn’t clear, or you just can’t get the hang of the instructions, turn to YouTube to search for your machine type and what you are trying to do (e.g. “Brother machine how to wind bobbin”). Since every machine is slightly different, be sure to search out a video if you get stuck! Wind your bobbin. 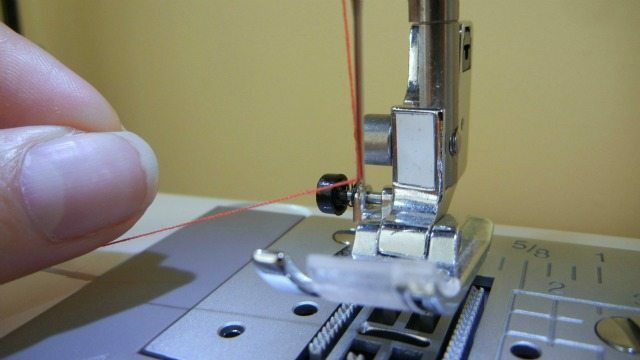 Using your spool of thread, you will lead the thread through a special hook on the top of your machine and then over to the bobbin winder. Put the thread through the hole on your bobbin, wind it a couple of times with your hand, then place it on the winder and click it over. When your bobbin winder is in place, your pedal will control the speed with which the bobbin winds. Once your bobbin is wound, it goes in place below the presser foot. Thread your machine. There will most likely be a series of somewhat confusing arrows on your machine that attempt to show you how to do this, but I would turn immediately to your manual or YouTube for this task. The first few dozen times you do it, it will take ages, but you’ll get quicker – practice makes perfect! Place your fabric. Once you are bobbined and threaded, it’s time to sew! It’s always best to practice a little on a scrap piece of fabric before moving to your actual project. Place your fabric under the foot, and clamp it into place. Your presser foot is controlled by a lever in the back of the machine directly behind the plate/needle/foot area. Hold your top and bobbin threads back with one hand, and use your handwheel to lower the needle into the fabric and bring it up once. There’s your first stitch! Sew! 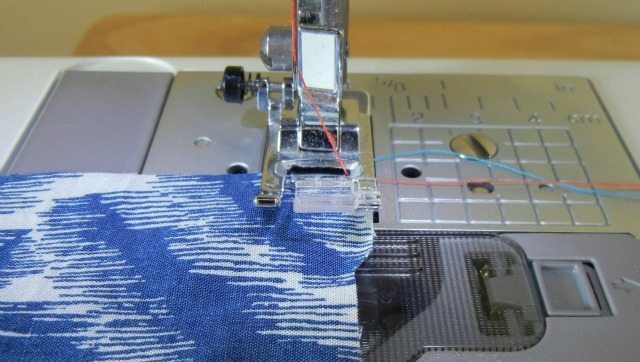 Your pedal works just like the accelerator pedal in a car; the more pressure you put on it, the faster it will “go.” Be very gentle at first and ease into it, sewing as slow as you need to at first. When you get to the end of a line of stitches, you can use the handwheel to bring the needle up out of the fabric. Then pull the fabric out from under the foot and clip the threads. Try to sew as straight of a line as you can. 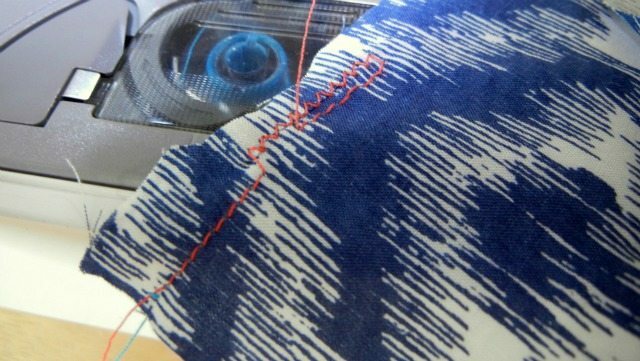 Experiment as well with the reverse stitches and the zigzag. 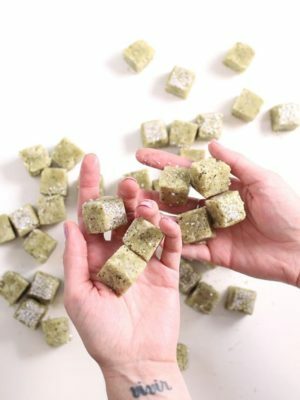 Use up as many scraps of fabric as you need until you feel comfortable! Dust is your enemy. Use a tiny brush to clean out dust and lint from all the parts you can reach, and get a can of air to spray in all the nooks and crannies. Always cover your machine when it’s not in use. Oil your machine. This is NOT all-purpose oil or WD40 – only oil specified for sewing machines! Again, look at your machine’s manual for instructions on which spots should be oiled, and how often (probably every 10-15 hours of sewing). Unplug your machine when you’re finished using it. This not only saves energy and prevents your light from burning out, but it also prevents tripping! 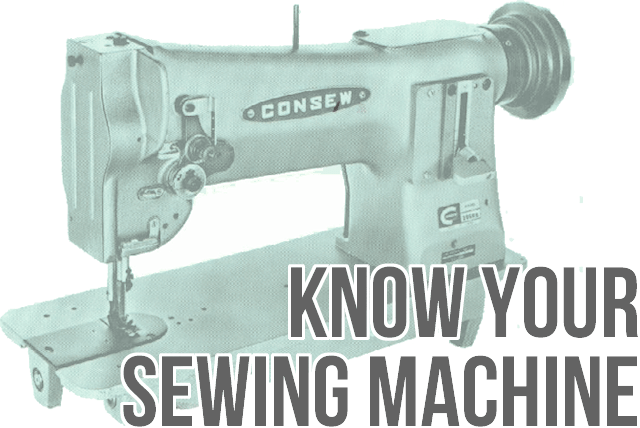 I bought my sewing machine in 1968, from you door to door sales man, while I was in college. I have moved many times since then. I can’t find my manual. The machine is a Universal, model number KAT. it was manufactured in Osaka, Japan. I just gave myself my first sewing machine. I tried today for the first time. Thanks for the tips, I did not know about the reverse sewing! It will help me! Thanks! Thanks Valerie. I know most of the basics but am having problems. This has helped. Ok, nice introduction for first time sewing machine users, but what about the skirt instructions? Measuring to see how much material you need? ( I am not a small woman) so telling us how to measure the waist for a skirt would be very helpful! Thank you. Hi, i saw this on pinterest and I just had to share it with my readers!! thank you for this awesome post! I am an experienced sewer but I love how thorough you are with your explanations and pictures. Good job! Also, I thought I had a tiny sewing area, but you got me beat! 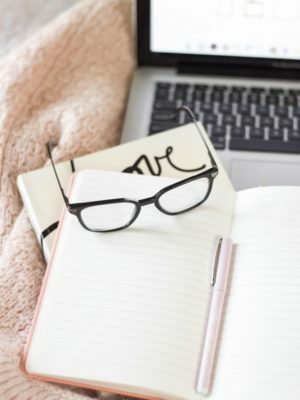 Your space is tiny but organized. :) Mine, not so much… Shhhhh! Thank you! It’s tough in a small space, so I try my best to keep organized, but it doesn’t always work, haha! What a great birthday gift! Best of luck – let me know if you have any questions! @Adventures in Dressmaking – I totally agree! I long for more elbow room, but unfortunately, that’s all the room my tiny NYC apartment can afford me right now. As I said, totally not an ideal space! 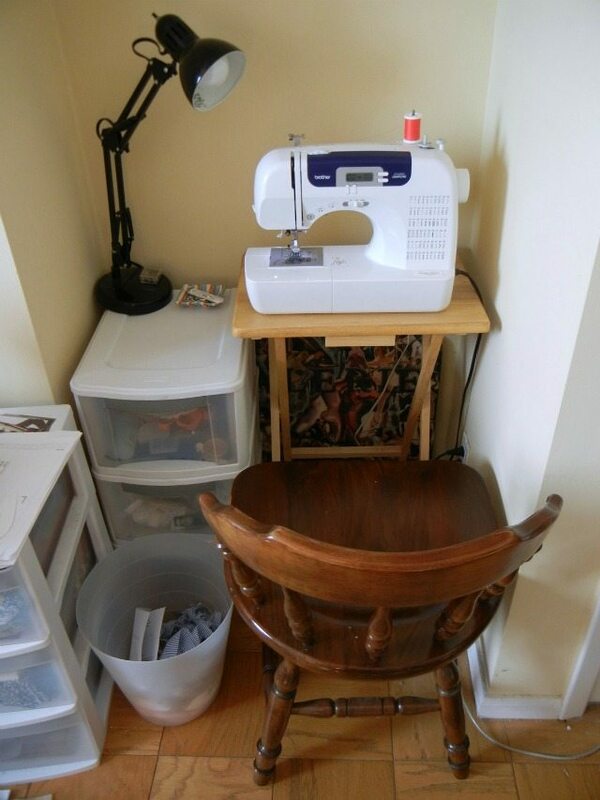 Great post, lots of info, but I would NOT be able to sew with my machine on that little table and no elbow room! I’d recommend pulling it out or putting it on a bigger table when it’s in use. Always good to have room for the project!